Scruggs, Metcalfe and Pye all had busy lives and were not about to drop their own business interests to spend a lot of time running American Arithmometer. More importantly, they didn't have the engineering or manufacturing management background that it was going to take to get Burroughs' machines off the assembly line and into customers' hands. Burroughs himself was too erratic to be trusted with that job either. In 1888, the Langhorne brothers entered the picture. The Langhornes were a semi-prominent family of Virginia capable of tracing their American ancestry back to the mid-1600s. Marriages with members of the Steptoe and Callaway families increased the family stature. A 2001 book by James Fox, Five Sisters, traces a branch of the family, arguably the most famous, headed by Henry Skaisbrooke Langhorne. Descendants of Henry included great-granddaughters "Gibson Girl," Irene Langhorne and her sister, Nancy Langhorne. Nancy would marry Waldorf Astor and become the first female member of parliament in England. We are interested in another branch of the family, headed by Henry's brother, William Langhorne. Both Henry and William moved independently from their birthplace in Warwick County in eastern Virginia to the western end of the state, eventually settling on large plantations in Botetourt County. William Langhorne married Catherine Callaway in 1811. They had seven children, the sixth being George Callaway Langhorne who was born in 1822 in Liberty (later known as Bedford) Virginia. You may recall that Richard Scruggs was born in the same year and in the same area. In 1845, George married Agnes Lewis White from a prominent landholding family and the couple had settled on a farm near Cloverdale in Botetourt County. Their first child, James Callaway Langhorne, was born in March of 1846. They would have a total of nine children by 1864. James and his younger brothers, Edward Gay Langhorne, born in 1860, and John Tayloe Langhorne, born in 1862, would play important roles in the management of American Arithmometer. The Langhorne brothers seldom seem to have used their full names. They appear on formal documents as J.C., E.G. and J.T. Langhorne. Occasionally, I have seen them as James, Edward and John. Informally, when they write to each other or to their sisters, the references are to Jimmy, Ned and Jno. J. C. attended VMI briefly before the Civil War began, studying engineering. At the outbreak of the war, he joined the locally organized Lurty's Company of horse artillery. He served as guidon bearer for the full duration of the war. The family finances were devastated by the war. George had been listed as holding some forty slaves according to the 1860 census. He took a position as postmaster in Cloverdale to generate income but was apparently tempted beyond his limits by cash being mailed into a nearby girls' school. He was arrested in the spring of 1872 and convicted at Lynchburg of robbing the mails. Sentenced to a term of five years at the state penitentiary at Albany, he died in November of 1872 before ever leaving the Lynchburg jail. This left Agnes to raise the several young Langhorne children. J. C. stepped into the void and after seeing to it that Edward and John got a good education, he set out for Colorado in the late 1870's to pursue opportunities in railroad construction. He soon discovered the boom in silver mining. Like many others, he ended up in Leadville. 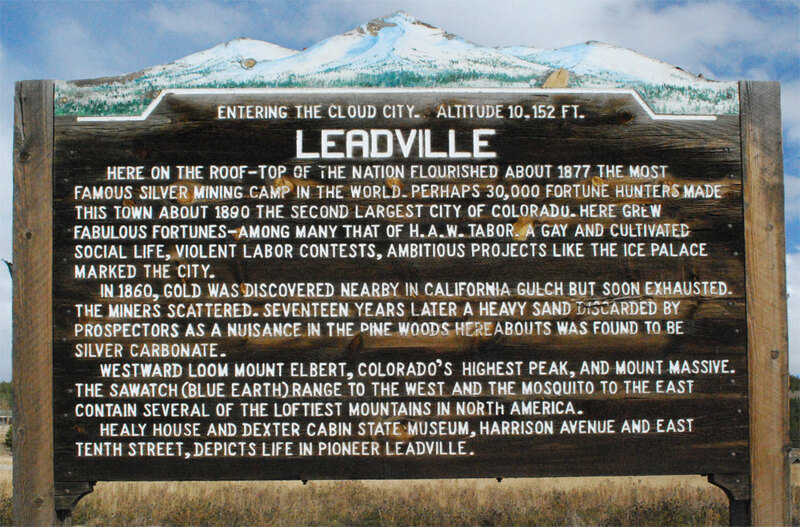 In Colorado, we find a report from early in 1880 of J. C. filing a claim on what would become the Vulture Mine near Leadville along with 11 other men including Colorado's lieutenant governor, Horace Tabor, and one Marshall Field. Yes, that's the Chicago department store Marshall Field. This claim had sold in total for $450 in 1878, but the silver boom was on. 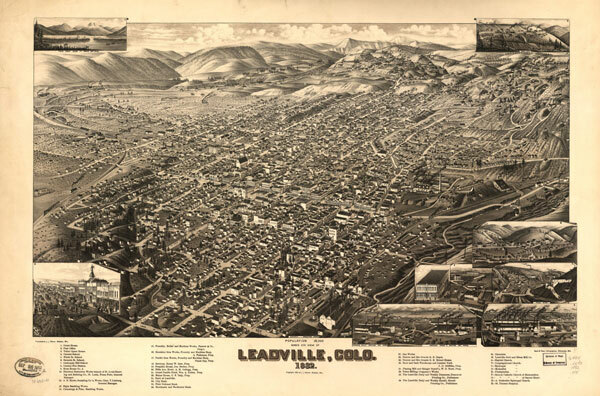 L.A. Kent authored a book titled "Leadville" later in 1880 which told the story of the boom. On pages 35-36, he shares this information about the Vulture. The telegraph wires on Tuesday evening, Oct 23d, bore to the acting cashier of the Bank of Leadville, instructions to pay to J.C. Langhorne the sum of eighty three thousand, three hundred and thirty-three dollars and thirty-three and one-third cents signed by H. A. W. Tabor. This was the first payment upon the purchase of a one-third interest in the Vulture mine and like payments are to be made upon the 15th day of January, and the 15th day of April, 1880, to complete the sum of two hundred and fifty thousand dollars One per cent, per month is to be paid upon deferred payments. J. C., who once had to pawn his watch to finance exploration of his first claim had suddenly become a wealthy man. Langhorne didn't just take his money and leave town, though. He stayed on for a number of years and became general manager of the Dinero mine, while living in the Tabor Grand Hotel. His name is associated with a number of mining ventures in the Leadville area including the sale of the Chrysolite claim for $500,000, another mine for $175,000 in 1881 and the sale of the Dinero in 1887 to Ewald, Kaufman & Co. of St. Louis for $150,000. 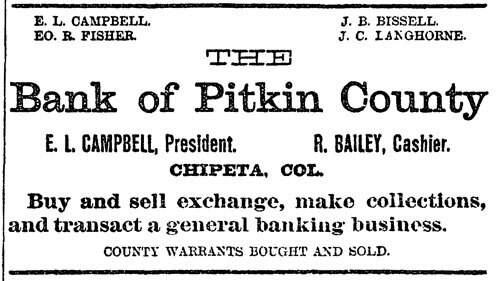 Beyond mining, Langhorne associated with key players in Leadville in other ventures such as this bank, opened in 1881 at Chipeta, (later known as Independence) along the newly constructed road to Aspen. His wife had accompanied J.C. to Leadville - a rarity in this very wild west town in the late '70s - and his two children were born there. ... And so far as Leadville – people are concerned, a great many are selfish enough to obstruct the sale simply to keep Mr. Langhorne here, as it is feared that on parting with the property he may return to his old home in Virginia. Still there are no definite grounds for this fear as Mr. Langhorne sold a large portion of the Chrysolite ground to the present company, receiving nearly half a million, and still Leadville did not lose him. In spite of the hope of the Herald Democrat, J.C. would return to Salem Virginia. He was reported as a Virginia resident spending the summer in Leadville by 1889 although late in that same year he attended the first National Silver Convention held in St. Louis along with Horace Tabor and two others representing Colorado mining interests. 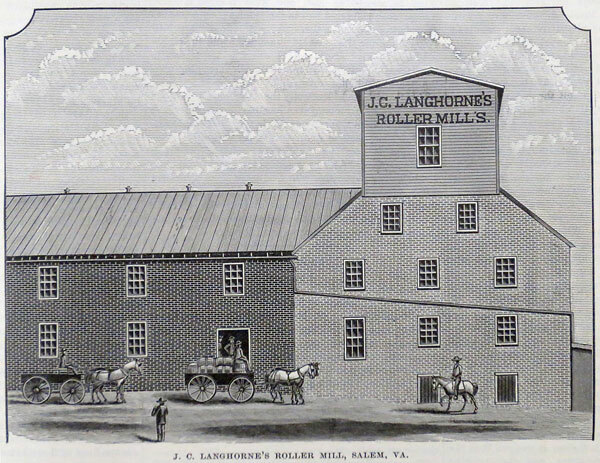 Over the decade of the 1880s, Langhorne had certainly not neglected his roots in Virginia. He had sold his mother's farm in 1885 with the family locating in Salem. He had acquired the flour mill on the western edge of Salem on the main line of the Norfolk & Western Railroad powered by the steady-flowing Roanoke River. In 1885, he upgraded it with the new technology of a roller-mill, with all of the details of the project being described in the weekly American Miller magazine which featured an engraving of the mill on its cover. ... The mill is under the management of Mr. A. M. Shipman, a man of sterling business qualities, Mr. Langhorne's extensive mining interests in Colorado demanding his time and attention there. Throughout the 1880s and 1890s, J.C. wisely diversified his wealth into both real estate and manufacturing interests in Salem and St. Louis. In 1889 he was associated with the development of the "Kenwood" suburb southwest of St. Louis along with local real estate developer, Moses Greenwood. A year later he headed the Steelton Land Company and the Dixie Land Company selling lots in Salem. In 1891 J.C. was named a director of the newly chartered Chadwick Two-Wheeler company. The Olean Cart Company of Olean, New York, had been induced to move its manufacturing operation south to Virginia where the Salem Development Company donated land for the large factory. 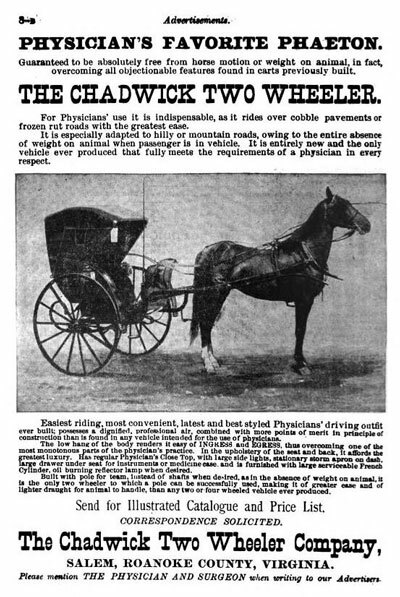 The Chadwick was advertised in medical publications as the physicians' favorite phaeton. Mr. Ed. Langhorne, manager of the large flour mills, created quite a sensation to-day, by driving up Main street in a very handsome combination sulky road-cart, made by the Chadwick Two-Wheeler Company, the first they have sold In Salem. He has used a Frazer cart hitherto, but says the Chadwick is superior to any cart he has yet tried. It was in mid-1888 that J.C. Langhorne and his St. Louis real estate partner, Moses Greenwood, Jr., invested about $16,000 each in the struggling American Arithmometer enterprise, becoming the fourth and fifth largest stockholders of the enterprise. J. C. was quickly rewarded with a seat on the four-man board of directors alongside Richard Scruggs, Thomas Metcalfe and William S. Burroughs.